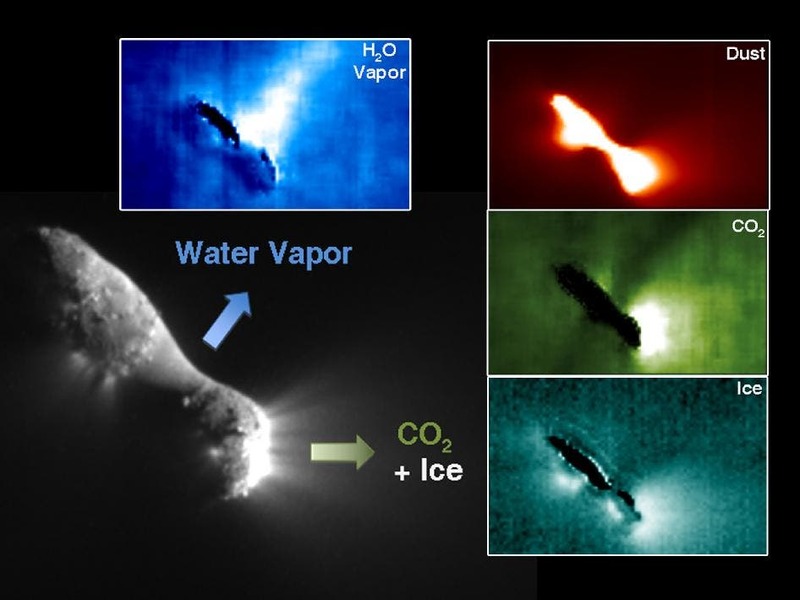 Infrared scans of comet Hartley 2 by NASA's EPOXI mission spacecraft show carbon dioxide, dust, and ice being distributed in a similar way and emanating from apparently the same locations on the nucleus. The EPOXI mission spacecraft revealed a cometary snow storm created by carbon dioxide jets spewing out tons of golf-ball to basketball-sized fluffy ice particles from the peanut-shaped comet's rocky ends. At the same time, a different process was causing water vapor to escape from the comet's smooth mid-section. This information sheds new light on the nature of comets and even planets. "This is the first time we've ever seen individual chunks of ice in the cloud around a comet or jets definitively powered by carbon dioxide gas," said Michael A'Hearn, principal investigator for the spacecraft at the University of Maryland. 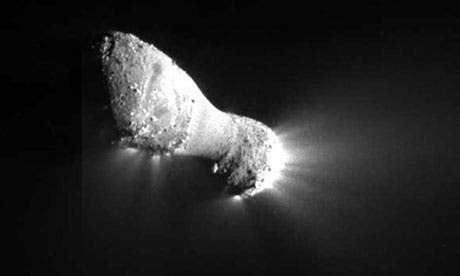 "We looked for, but didn't see, such ice particles around comet Tempel 1." The new findings show Hartley 2 acts differently than Tempel 1 or the three other comets with nuclei imaged by spacecraft. Carbon dioxide appears to be a key to understanding Hartley 2 and explains why the smooth and rough areas scientists saw respond differently to solar heating, and have different mechanisms by which water escapes from the comet's interior. "When we first saw all the specks surrounding the nucleus, our mouths dropped," said Pete Schultz, EPOXI mission co-investigator at Brown University. "Stereo images reveal there are snowballs in front and behind the nucleus, making it look like a scene in one of those crystal snow globes." "The carbon dioxide jets blast out water ice from specific locations in the rough areas resulting in a cloud of ice and snow," said Jessica Sunshine, EPOXI deputy principal investigator at the University of Maryland. "Underneath the smooth middle area, water ice turns into water vapor that flows through the porous material, with the result that close to the comet in this area we see a lot of water vapor." Engineers at NASA's Jet Propulsion Laboratory in Pasadena, Calif., have been looking for signs ice particles peppered the spacecraft. So far they found nine times when particles, estimated to weigh slightly less than the mass of a snowflake, might have hit the spacecraft but did not damage it. "The EPOXI mission spacecraft sailed through Hartley 2's ice flurries in fine working order and continues to take images as planned of this amazing comet," said Tim Larson, EPOXI project manager at JPL. EPOXI is a combination of the names for the mission's two components: the Extrasolar Planet Observations and Characterization (EPOCh), and the flyby of comet Hartley 2, called the Deep Impact Extended Investigation (DIXI).